‘Do I need a coat today or not?‘ is one of the questions we find ourselves asking regularly during the unreliable summer months or during that tricky transition time! 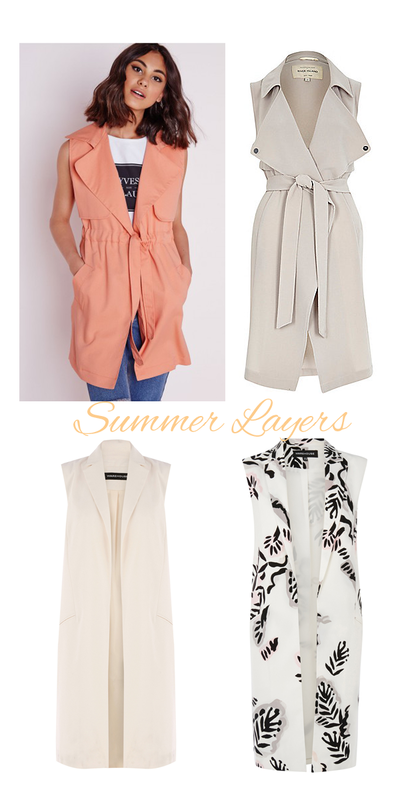 For those mornings where you know it’s going to be a lovely day but there’s a slight nip in the early air, or maybe you want to dress up a basic jeans and tee look – the sleeveless summer coat is your new best friend. We love this light, airy layer as it’s a piece that will lift any outfit making it look effortlessly pulled together. From work, to weekend or even travelling it’s one of our key summer pieces – so today we’ve compiled four of our faves along with some gorgeous styling inspiration! We love the pop of colour in the Missguided style above and it’s the perfect weekend piece. The River Island trench style is timeless and chic; while the Warehouse waistcoat options would work equally well with skirts and culottes in the office as they would with your favourite pair of jeans. What are your thoughts on the trend? Let us know in the comments below!